the scent of green bananas: back to the old house. Posted by santos. This entry was posted on 20050830 at 12:30 AM You can skip to the end and leave a response. It's been a while since I've checked into your blog and imagine my shock at work when I were in Pampanga! My mom, now retired, made a home where her parents' house originally stood before it was overrun by the lahar. I haven't been back in 5 plus years (she's always visiting me and my brother in the states) but I'm hoping to make a trip back there next spring. But back to your grandmother's house, I enjoyed the photos and it made me miss my mom a bit more. 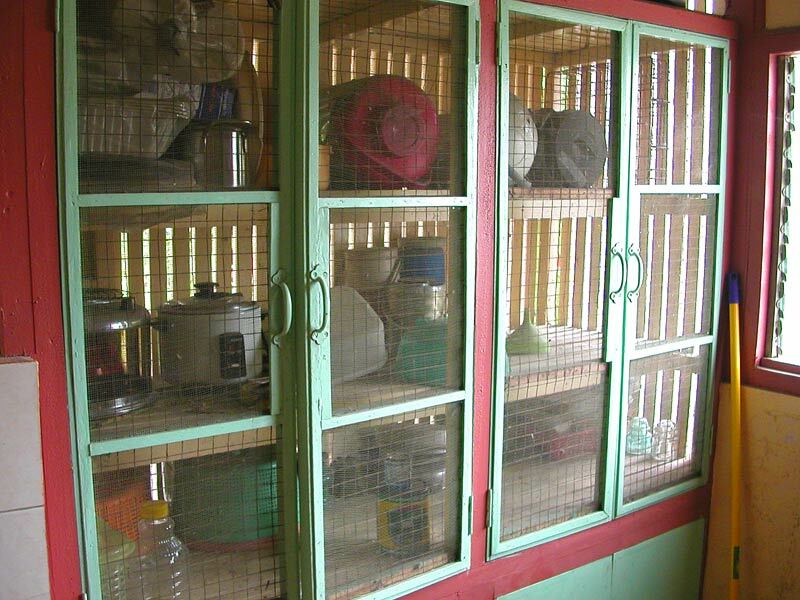 Oh yes, the paradul asan - literally viand cupboard. That's where all the pots of adobo, humba, paksi and pititian (chicharon) stay. I also remember your Lola in the kitchen. Oh, the succession of fierce-friendly guard dogs should be included too, hehehe! I am so envious of your trip, what fun and what great memories. I must go with my mom to Vietnam one of these days. Glad your back, I woulld like to tag you for a childhood foods meme but thought I better ask first. P.S. Just saw the house next door on your Flickr. It should be familiar to Filipino movie buffs, especially Aga Muhlach fans. The interior scenes for Kailangan Kita (with Claudine Barretto) were shot mostly in the Castro house but the setting's supposed to be in Bicol. Cheaper to shoot in our town. Could of sworn I left you a comment yesterday... maybe I dreamed it. In any case, just wanted to say I'm really enjoying your Manila posts and especially enjoyed seeing your family home. It really is beautiful - I love the colors and (as you said) the airiness of the place. I also looked at your photos on flickr - just wonderful! Who lives in the house these days? Hi K. I love your point of view on things. I always thought you'd make a good humorist (humorer? humor-warrior? humorgifier?) I should email you some of the old pictures we have of sta. rita, if i can find them. my room is a big mess. Watch out for those low-flying typhoons. hi joey! i love the colours too--very festive. hi darlene--i'll bet karen could figure out if we're related :) i hope you can visit your mom soon. hi karen! thanks for the proper terminology! are you starting a new project? i would love to do the history of the house. hi gia-gina--i hope you do go back with your mom sometime. i appreciate the province more now that i'm older, and hope to spend more time there. hi cathy! yeah, i think blogger swallowed up a bunch of my comments recently--i left one on yours that disappeared, one on j's, and one on gloop's, and they're all gone. i hope they don't reappear randomly weeks from now. no one lives at the house, but there's a caretaker who looks in and feeds the dogs, and my aunt and uncle check on it frequently. ANDY! my cousin, everyone. humongous, you mean. trash compactor. i want a copy of that photo of your mom modelling that hottie one piece swimsuit and rockin' her beehive 'do. hi milgwimper--i'm ashamed to say i haven't been to korea yet. i would love to go sometime. have you been there recently? it's a fascinating country. Hehehe! I don't care for Aga either but guess what? I was 'coerced' into watching the movie just because the scenes were shot mainly in Sta. Rita. Glad I did, it's a good Filipino (Bicolano) foodie movie. Next time they make a Kapampangan foodie movie, I'll volunteer ourselves as consultants. Mwahaha! On the history of the house, basta Ate, just write. ;-) I can see more cousins checking in (there's at least one lurker)!